The official jsreport package is distributed through npm. You can find the installation instructions for each platform in the download section here. After you follow the installation steps you should be able to reach jsreport studio in the browser. 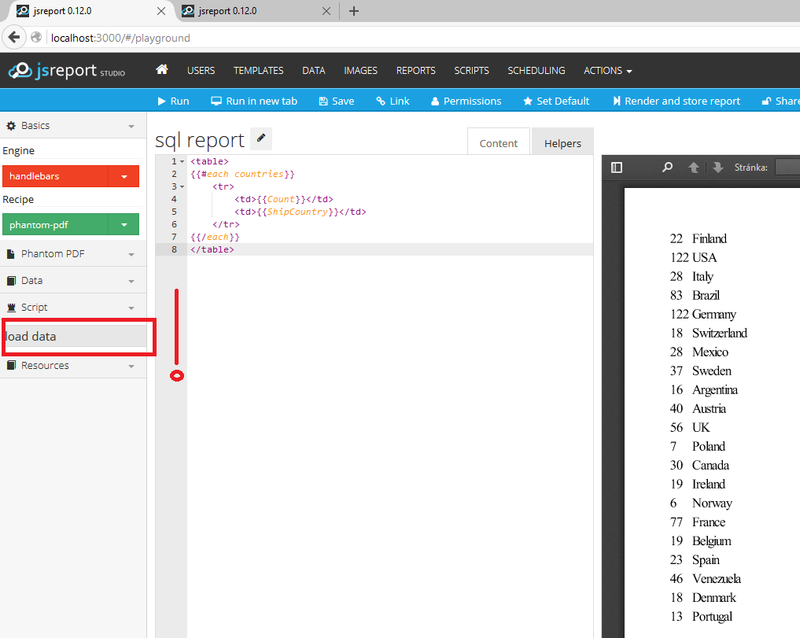 Now I'll continue to show you the integration with SQL Server, if you are eager to learn more about jsreport right away, you can switch to get started article first. This module must be also explicitly allowed in jsreport configuration because by default are all additional modules blocked for security reasons. This is done by adding following section into jsreport.config.json file, which was created during the installation. Restart jsreport and proceed to the next step. The first step is to prepare the input datasource for the report. In this example I will fetch the data from the SQL database using custom script and as the datasource I'll use standard northwind. Now I create the script using jsreport studio ACTIONS/Create script. This will be the script running in jsreport server and fetching datasource. It should look the following way. Now you should create report template using jsreport studio ACTIONS/Create template and associate previously created script with the new template. To design the report I use html together with handlebars templating engine. This allows me to dynamically create the layout based on the input data. I can for example iterate over data and print a table from it. If you run such a template you see it produces pdf right away. This is because of selected phantom-pdf recipe. The jsreport recipe is an algorithm responsible for assembling the report output and this particular one is using phantomjs to convert html into pdf. You can also try a different one like html-to-xlsx which prints excel. You can find many examples in the highcharts documentation and everything will run in jsreport as well and produces pdf. You only need to always turn off animation, otherwise the pdf won't contain complete chart. I want to render a pie chart from the data I prepared in the script now. To push the data into the chart I use a little trick I described here. I create a custom helper function in the studio helpers tab. And use this helper to create the input data object inside template's script tag. This is a bit tricky and not obvious, but you should be able to understand it from the mentioned blog post. The final template content then looks the following. Running this template you should see a nice pie chart in pdf format. When you have the report template ready, you can integrate jsreport through API to your system. This is usually done though just one REST call which invokes the report rendering and streams back the pdf. Restart jsreport server and the templates should be stored inside SQL Server afterwards. I revealed only small part of jsreport in this tutorial. There is much more including scheduling, permission delegating and more than 30 other extensions available. If you like jsreport and want to know more you can see deep dive sceencast or navigate to learn section.